Yefsi: Greek for flavour, and also the name of the cafe restaurant downstairs at Attika hotel in Northbridge. It’s not quite on the main restaurant drag, but it’s easy enough to spot and when I saw the menu I knew I wanted to try it out. 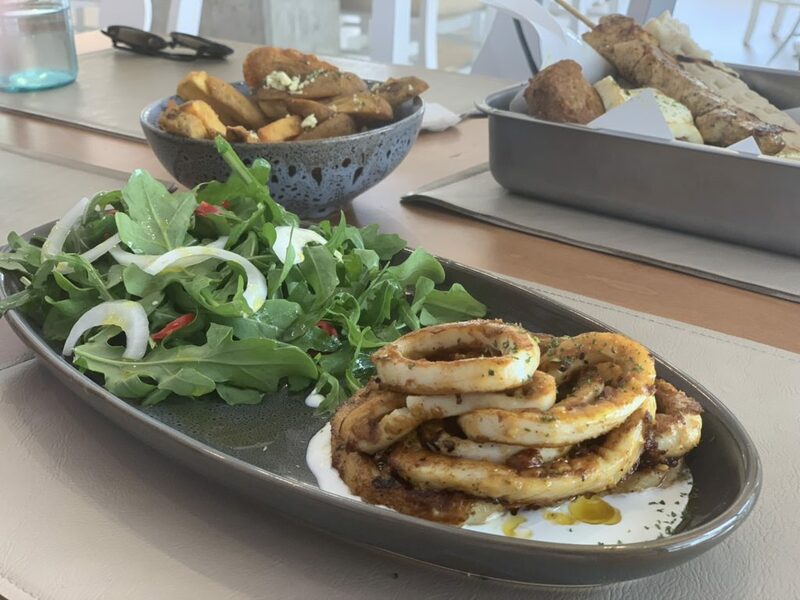 I love Greek food (okay I love all food) – especially when there’s a focus on the generous spirit of dining, seafood and charcoaled meats. I was really excited to dine here, and even more so because I was catching up with a couple girlfriends I hadn’t seen for a few weeks. We timed it so we got there just before lunch, allowing us to choose from both the breakfast and lunch menus for our meals. We situated ourselves in the back corner, which was streaming with sunlight (hence why my photos are pretty whitewashed from light!) and gave us a view of the entire restaurant. Service was friendly and efficient, though there weren’t many other tables filled around us. It didn’t take us long to order as we were all starving, and excited for the feast to come. 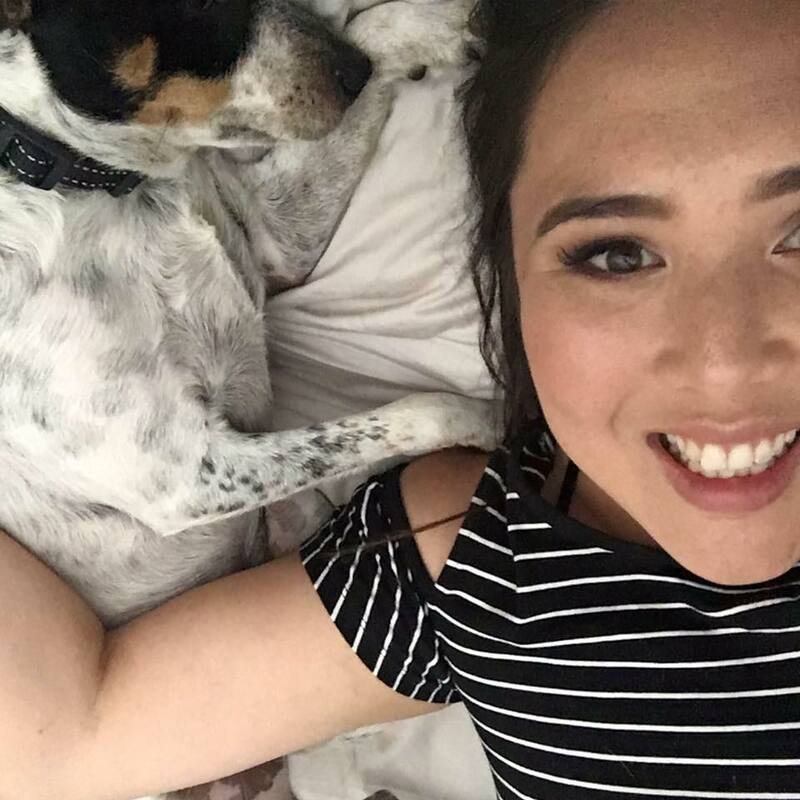 While normally we’re all about sharing, we decided on this occasion to go solo for the most part. 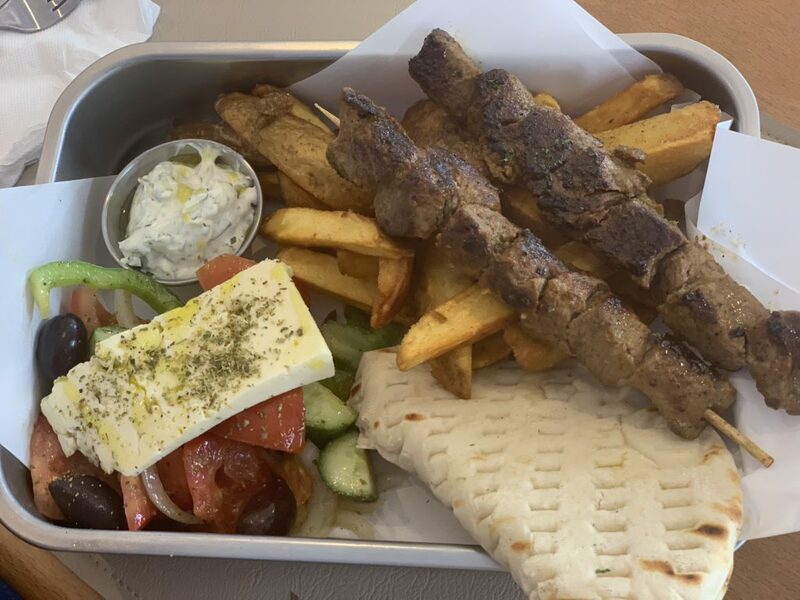 For one of my girls, their meal of choice was the souvlaki skewers ($22.00), which comes with a choice of chicken, lamb, pork or vegetable skewers, plus salad, rustic chips, tzatziki & pita. She chose the lamb, which is always a winner when it comes to Greek cuisine (it is their specialty after all). 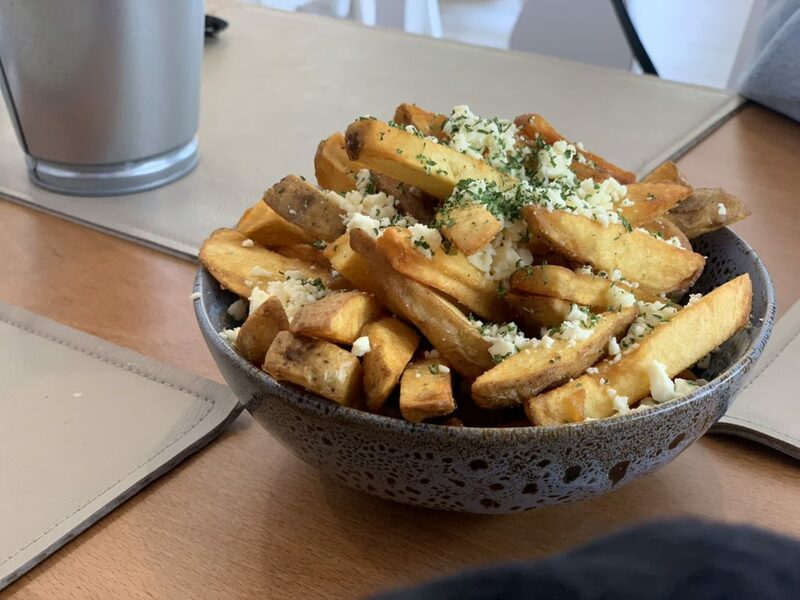 A bowl of patates ($6.00) with feta added ($4.00) was included in the order for us all to share – though I think ate most of them! The serving size of the souvlaki was huge, which was already a big tick in the plus column. I thought the meal looked juice and succulent, and that tzatziki was the ideal accompaniment. 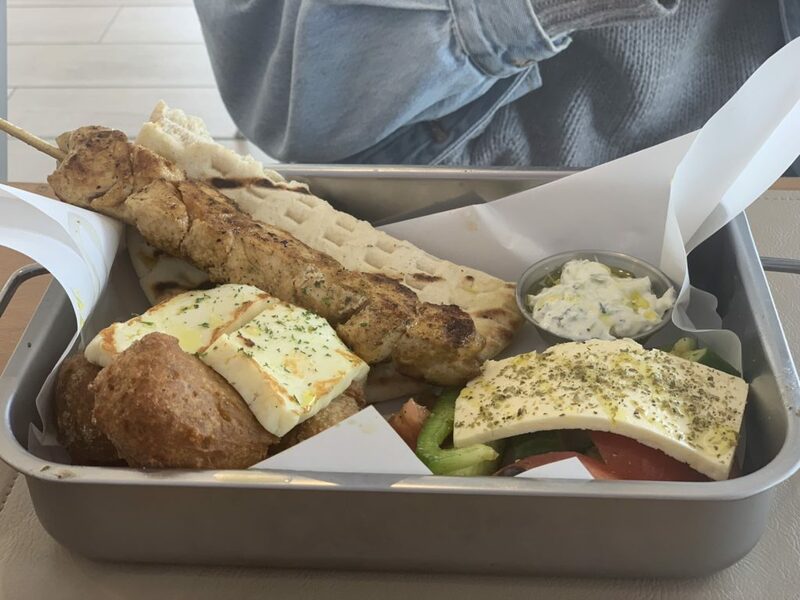 She told me the pita was an excellent and needed touch that tied it all together and made it a very filling, complete meal. Feeling extra hungry, my other girlfriend order the Revithokeftedes ($18.00) which are chickpea fritters that came with Greek salad, haloumi and pita. 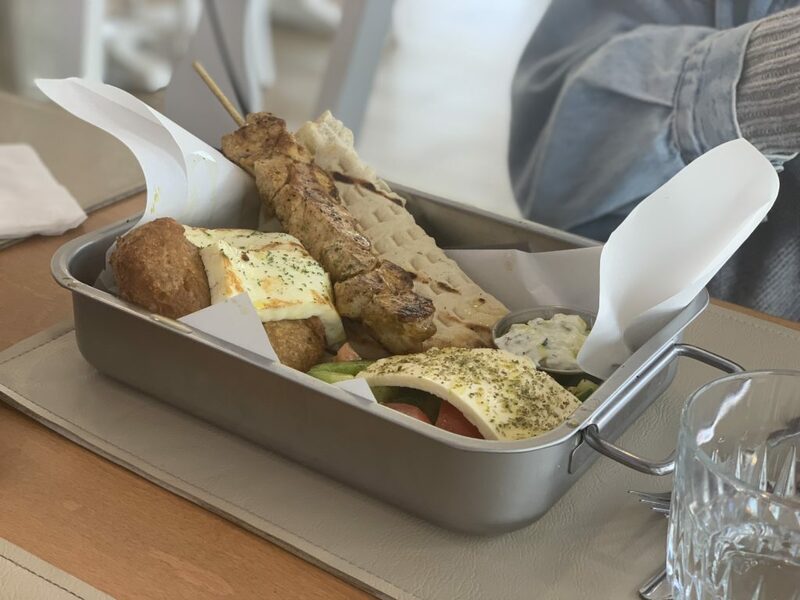 She opted to add on a chicken skewer for an additional $5.00 – though she told us after she probably didn’t need to as she was full enough from the rest of the food on the plate. The chickpea fritters looked so good! And definitely my kinda dish. Especially when accompanied by the grilled haloumi which is a bit of a weakness for me. I will be ordering this next time I go to this place. 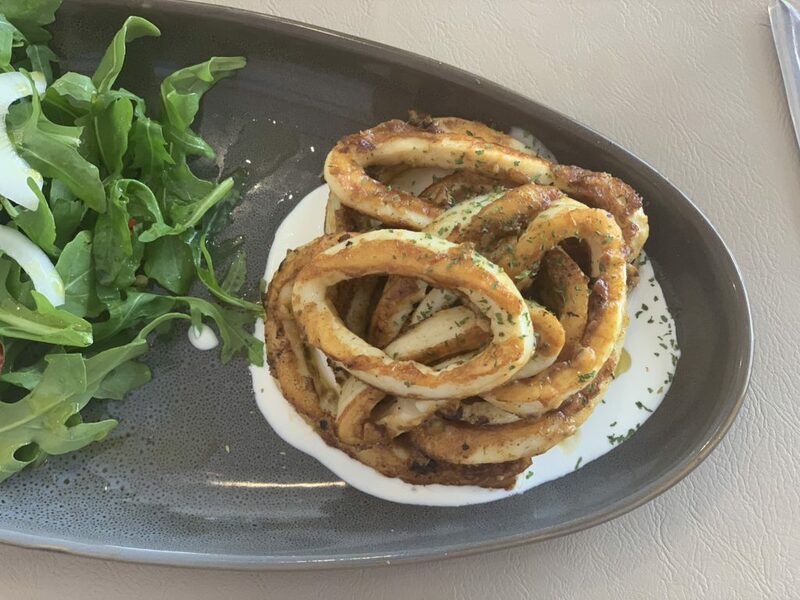 I kept things a bit simpler, choosing the grilled squid ($18.00) which comes with goat’s cheese, rocket, chilli and onion. 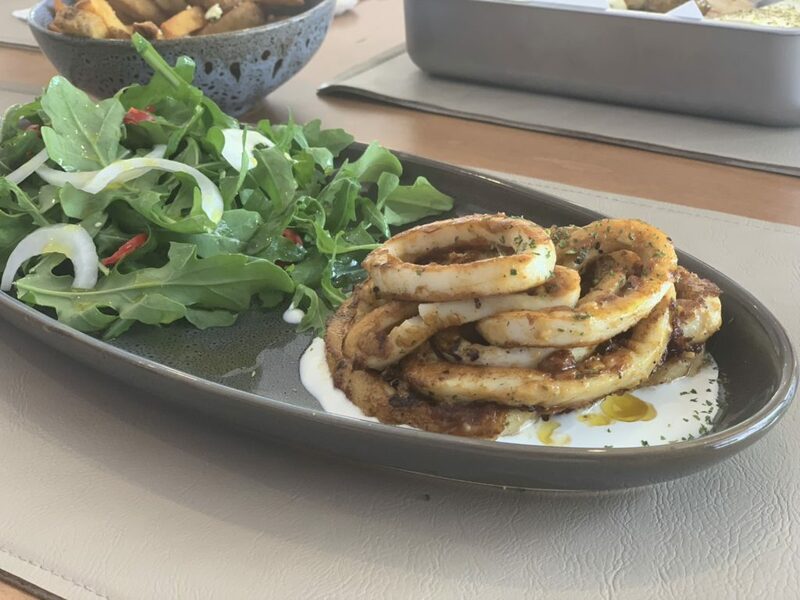 It’s a small dish, but the squid was cooked perfectly: retaining the right balance between tenderness and bite. I really enjoyed this, especially when supplemented by the potatoes to round out the meal. There was so much flavour in the seasoning and cooking of the squid, making it really stand out. 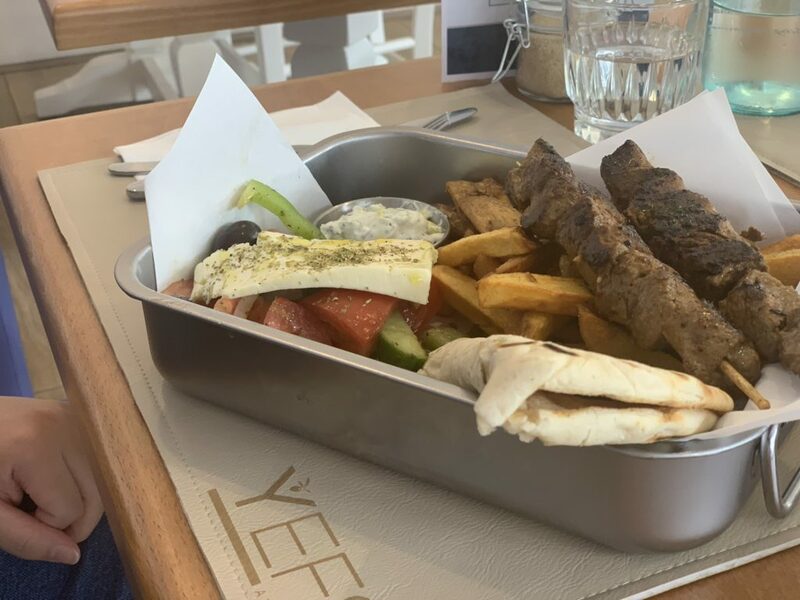 We didn’t try too much of the menu at Yefsi, but what we did try was really good. It’s a simple style approach to Greek cuisine, but I think that’s what made it so enjoyable. No bells, no whistles, just honest to God good cooking. It felt like we were at a Greek auntie’s house dining on some family recipes, which made it even more enjoyable. I’m keen to try some of their breakfast dishes next time since we focused on the lunch offerings this time around. The baklava pancake have my name written all over them!